Learn how to stitch up a simple butterfly bail that's easy to attach to all kinds of beaded pendants. It's composed of two "wings" of strung beads that emerge from a center "base bead" in the front. You can stitch the bail using a new length of beading thread, or use existing thread that you used to stitch your pendant. You'll need a minimum of about ten inches of thread to complete the bail. Weave through the pendant beadwork (making a few half hitch knots along the way, if you're starting a new length of thread) and bring the needle out in a logical place to center the bail. In the example, the needle was brought out halfway through a stitch that contained a total of six beads. The front of the bail features a bead, which is the base bead, that is larger than the other beads you'll use for the bail. In the example, 3.4mm of Miyuki drop bead is used to match the drop beads in the pendant. Pick up your base bead, and slide it down against the pendant. Pick up enough smaller beads to make a little strand that, when wrapped backward to touch the edge of the pendant, is large enough to slip over the jewelry chain, cord, or beaded rope for your necklace. The example uses size 11/0 Miyuki seed beads. Slide these down against the base bead. Turn the pendant over, and anchor the first wing by passing through two beads; one on each side of the place where your thread exited the pendant in Step 1. Pull the thread taut. Pick up the same type and number of beads that you picked up in Step 3. Flip the beadwork over again and pass down through the base bead. Pull the thread taut. Pass back through one bead in the pendant, moving your needle toward the first wing of the bail. Pass up into and all the way through the second wing, down through the base bead once more, and then back into the pendant beadwork. 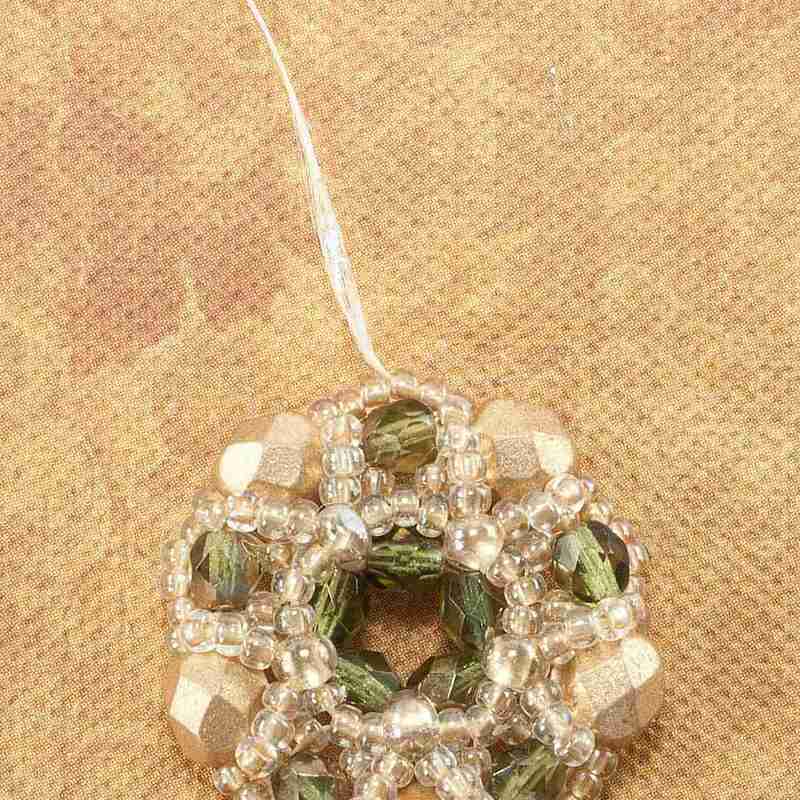 You can now weave-in and end the thread within the pendant beadwork. String your pendant on the chain, cord, or beaded rope of your choice. The example shows the pendant on Vintaj dark brass etched cable chain.